Instant messaging is no longer a fad as the masses are heading to social networks, but many still rely on chat for communicating with others. If you are anything like me, you probably still have a handful of accounts with various services. Trillian for Windows, which has been around for over ten years, makes life easy since it handles just about all the popular chat networks within a single program. In late 2009 we reviewed Trillian for iPhone, which Cerulean Studios managed to launch after some struggles with the Apple App Store approval process. Fast forward to December 2010, the company just pushed Trillian into the quickly growing Android Marketplace. After a few months in public beta, Trillian fans can now chat on AIM, Facebook, Google Talk, ICQ, Jabber, Live Messenger, MySpace, and Yahoo on their Android device. Unlike other mobile chatting solutions, Trillian syncs contact lists across all your devices. If you add or rename a contact on your phone, the additions or changes will reflect in the buddy list on your computer. Rather than porting an existing mobile app from platform to platform, Cerulean Studios designed this App from scratch. As a result, users get a truly native Android-like experience. The app blends into the Operating System and works so smoothly that if feels like a Google-built product. The main screen displays ongoing conversations at the top while collapsible sections contain sets of contacts along with avatars below. Users have full control over grouping and sorting the buddy list. The app even hides offline contacts by default to reduce clutter. Unlike the iOS iteration which relied on push notifications to simulate multitasking, Trillian for Android can actually run in the background. Users can even enable audible, vibration, and LED light notifications for incoming messages. I had it running on my HTC EVO 4G and a Samsung Galaxy Tab without any issues. The app handles multiple conversations efficiently with a tabbed interface for quick switching. It is also easy to send photos to friends from within the Trillian App. For those wondering, Trillian runs on both 3G and WiFi networks seamlessly. However there are some features that are missing. For instance, there is no support for transferring files which are not images. In addition it lacks support for video chat even though quite a few mobile apps are beginning to offer the feature. There is also no support for FourSquare, LinkedIn, and Twitter, which the desktop version offers. 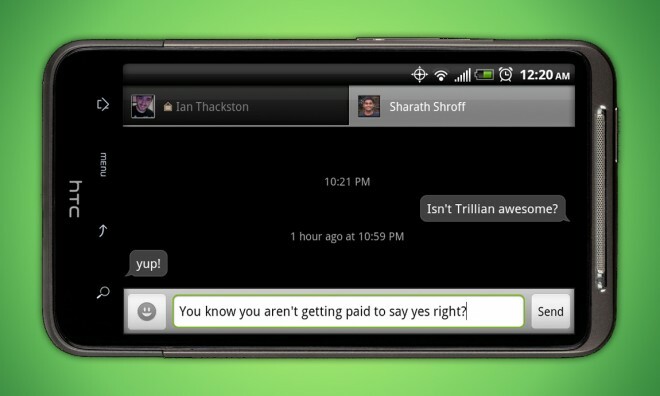 If you have an Android phone and still rely on instant messaging, Trillian is definitely worth considering. It offers excellent integration with the web-based Trillian.im, the Windows 7 version, and the Macintosh edition. Cerulean Studios is also working on a way to offer paid customers the mobile app for free. This would be great since users like me have already paid for the “Pro” desktop client and the iOS App. As for new users, Trillian for Android is available for $5 in the Android Marketplace. If you only chat occasionally and are looking for a free alternative, I definitely recommend trying eBuddy Messenger. if anyone at trillian reads this, PLEASEEEE add video chat. skype would be best waiting for soooo long! great review… may i copy paste your review to my blog? You are welcome to do so, but under a few conditions. Please read our “License to Use the Website” section of our “Terms and Conditions” document before doing so.